This thought-provoking trilogy of stories explores the very essence of loneliness and stands as a stirring introduction to modern Japanese literature. It unfolds as three stories that are all related. The story of the student (narrator), the student and the Sensei and lastly the Sensei himself. It's funny but I find myself returning to Japanese literature if I've been either feeling unsettled in my reading or life. It makes a great palate cleanser for me. This is also a return to this book. The first time I read it I was far from being in the right place to appreciate it and only read about half. On the re-read I'm finding I appreciate it much more. The change in narrative perspective really helped to balance the story. Going from an almost cold and distant recital of the Narrator's life then starting to show the Narrator's struggle with his own ethics and finally to the more heartfelt history of the Sensei's life. The simplicity of his writing conveys the ideas of loss, betrayal and loneliness far better than the most flowery prose. Not that this novel is written without beauty. There is much that is gentle and serene to be found here. Also we see that things unsaid may do more damage than good. Death and suicide seem to figure prominently in a lot of Japanese literature and this story is no exception. Honour is so closely paralleled with them that it's a part of the culture. I still find it odd that Murakami's book Norwegian Wood dealing with it had less of an impact on me than Soseki's. I think it's because Murakami's characters lacked the depth and reasoning that Soseki's did. Soseki's Narrator and Sensei live in a world of honour whereas Murakami's characters seem to live in a world of selfish indulgence. Don't get me wrong. I love Murakami but sometimes I prefer this form of writing. 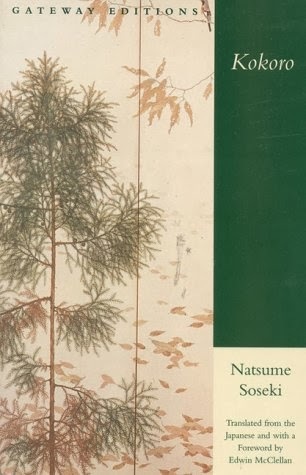 This is a great first read for someone wanting to explore classic Japanese Literature.